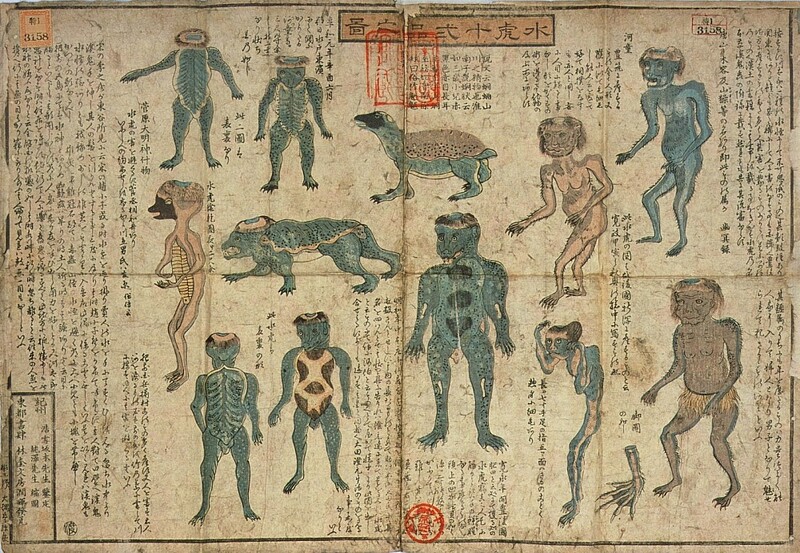 Stories are told all over Japan about Kappa, a human-like water dweller that is said to inhabit waterways and ponds across the country. The kappa is as well-known a monster in Japan as vampires and werewolves are in America and Europe, and they often feature as characters in modern movies, cartoons, comics, and games from Japan. Places -- especially bridges -- are named after kappa, and japanese proverbs feature these water dwellers as examples of perfect swimmers. It is by no means an exaggeration to say that every single person in Japan old enough to converse knows what a kappa is. This is why the kappa makes my personal list of the top six monsters from Japan that visitors need to learn about if they want to really understand Japanese culture. Kappa from the 2005 movie "The Great Yokai War". Descriptions and names for kappa can vary in legends across the country, but the modern version that everyone recognizes is a humanoid about the size of a eight to ten year old child, with green skin, a turtle shell on its back, either a turtle-like beak or a frog-like mouth (this detail can vary), webbed fingers and toes, short black hair, and, most distinctively, a bowl shaped impression on the top of their heads. This bowl must always have water in it for the kappa to be healthy. Under water, this is not a problem; but when on land, kappa must be careful not to spill the water from this head-bowl or they will instantly become weak and helpless. Despite their small size, a kappa is much stronger than any man... and because of this, tales tell that kappa love to challenge humans to sumo wrestling matches, knowing they'll win. If challenged by a kappa, the wise move is to bow very low to the kappa before the match begins. The kappa's own inbuilt politeness will force it to bow just as low, and the water will run out of the bowl on its head making it easy to defeat. Be aware, however, that many kappa possess the ability to change their appearance to look human. They generally can't change their size though, so they disguise themselves as small people: children, short monks, and old women are popular disguises. These disguises don't keep them from spilling their water, so always remember to bow low to anyone who challenges you to a wrestling match (especially if water is nearby!). Kappa love cucumbers, and will steal them when they can. Since the traditional method of cooling vegetables and keeping them fresh was to place them in a bag tied to shore that would float in a cool stream, kappa often got the opportunity to take cucumbers. Cucumbers were sometimes offered to kappa in advance of humans entering waterways, both to distract the creatures and to buy their good behavior for a short time. This is also why the popular cucumber roll at sushi restaurants is called a 'Kappa-Maki'... a "kappa-roll!" Kappa, like people, display a wide range of behaviors. Many stories tell of kappa that only want to drown or harm people, but in other legends kappa can become friendly when treated right or spared from death. These helpful kappa can warn when unfriendly kappa are nearby or, sometimes, teach people how to make secret medicines known only to the monsters. There are many Shintou shrines in Japan dedicated to different kappa, usually in the hope of appeasing them so they won't cause trouble. But enough of the basics: the only way to really get a feel for the variety of kappa legends in Japan is to read some, so here's a number of legends from a variety of places. Oh, and keep one more thing in mind... there's also a number of accounts and objects that some people claim prove that kappa exist. I'm writing a separate study of these anomalous claims and will post it when it's ready. For now, just relax, read, and enjoy! 1962 (pub): Let's Play Pull-Finger!